This recipe has a number of steps but it is really quite simple to make. If you don’t care for spicy food, simply leave out the hot pepper. Rinse quinoa under running water in a fine-meshed strainer. Transfer to a small or medium sauce pan with a lid. Stir in 1 ½ cups vegetable stock or water and bring to a boil (about 2 minutes). Reduce heat and simmer for 20 minutes. You’ll know it is done when the quinoa grows tiny little tails and all of the water is absorbed. Remove from heat and fluff with fork. This is a deliciously flavorful way to eat potatoes. I first tried this dish at a fantastic Indian/Sri Lanken restaurant called, Dosa Garden, in Staten Island, NY. I was so smitten by the flavors, I hounded the owner to share the recipe with me. He gave me the general ingredients and this is the version I cam up with. I think it comes pretty close. While Kandi, from Dosa Garden, uses oil when he prepares this dish, this is an oil-free method. The preparation times of this dish overlap into the cooking time. Wash and dice potatoes, leaving skin on (5 – 7 minutes). Rinse and transfer to a medium sauce pan with a lid. Put in enough water or vegetable stock to come half-way to the top of the potatoes (1/2-1 inch, depending on the size of your saucepan). Bring to a rapid boil. Reduce heat and cook at a low boil until fork tender. While the potatoes are coming to a boil, peel and chop onions. Heat your sauté pan and add chopped onions. Stir. Add curry leaves, cumin seeds, and mustard seeds. Sauté, stirring frequently, until onion is translucent. Add 1/8 cup water, turmeric, black pepper and chili powder. While the onions and potatoes are cooking, prepare cashews. You can leave them whole or chop them into coarsely chopped pieces. In a small fry pan on medium heat, brown cashews, turning them over with a spatula or flip them in the pan frequently. When they are lightly browned, transfer to a cool dish. Don’t leave them in the pan to cool because they will continue to brown and will possibly burn. Set aside. When potatoes are fork tender (most of the water should be boiled away), drain, reserving liquid, and add to onion mixture. Toss all ingredients until completely covered with the spicy onion mixture. Mash mixture with a potato masher. If the potatoes feel a little dry, add a little of the reserved potato water, 1 tablespoon at a time. Fold in cashews. Garnish with cilantro leaves. Serve hot as a side dish as a filling for Utthappam (Indian Potato Pancakes), or as a filling for Swiss Chard Rolls. This is also good served cold as a potato salad . Tahini sauce is delicious over just about any grain dish. It will keep three days in your refrigerator and reheats well. You can make it to the consistency you desire. In a blender on medium-high speed, blend all ingredients until smooth. If you have a high-powered blender, like a Vita-mix, you can put it on high and blend until the mixture is thick like heavy cream and warm. Add just enough water to thin to a nice creamy sauce. The only problem with using a Vita-mix for this is that the sauce will tend to be a little frothy, with lots of small bubbles in it. While this doesn’t affect flavor, it can give it a less desirable appearance. I, personally, don’t mind this but if you do, blend this in your regular blender and transfer it to a small saucepan and finish the process on the stove. If you prefer to heat it on a stovetop add 5 minutes to preparation time. If you don’t have a Vita-mix, transfer the sauce to a small saucepan and carefully heat on medium-low until thickened, adding water until you achieve a warm sauce with the consistency of heavy cream. (Nut sauces like to burn so stir frequently. Pick out the largest swiss chard leaves you can find and those with few or no tears in them. While the water is heating, wash several chard leaves to get rid of any residual dirt and grit. Choose a large leaf and turn it over onto a chopping board so that the bottom rib of the leaf is exposed. Lay a paring knife on its side and gently shave about half of the stem off, taking care not to cut through the stem entirely nor accidentally puncture the leaf. This will allow the leaf to bend easier while rolling it. Cut off stem at the base of the leaf and save for making vegetable stock, put in compost or discard. We won’t be using it in this recipe. Remove lid from water and reduce heat to simmer. Gently lay prepared leaf in hot water and submerge for 30 seconds. Remove with a tong and transfer to cold water bath to stop cooking. Once cooled, remove from water bath and spread out on towel to drain. Pat with another clean towel to dry exposed side of the leaf. Repeat process with all the leaves you plan to stuff. Take wilted leaf and place, shaved stem side up, on a chopping board or large plate. Spoon a generous portion of Spicy Potatoes Masala (see recipe) onto the bottom of the leaf and roll towards the top of the leaf, tucking the potatoes under as you go. When you’ve completed one full turn, fold the sides of the leaf towards the middle. continue to roll until you’ve used the entire leaf. This technique is very similar to rolling a burrito. Prepare a bed of Red Quinoa (see recipe, you may substitute any other type quinoa) and spoon some Tahini Sauce (see recipe) over it. Arrange one or two swiss chard rolls on top of the quinoa, then drizzle some more of the Tahini Sauce over the top. Enjoy! I don’t know how I ever lived without a Vitamix. This is an excellent product and lasts a very long time. It is multi-functional and it makes it possible to make creamy cheeses from nuts and ice creams, which are virtually impossible with a regular blender or a food-processor, as well as sauces, soups, breads, and much more. I use my Vitamix every single day and have for the past eight years. It’s still going strong! I’ve not personally tried these particular brands of whole organic cashews. They have good ratings on Amazon and are reasonably good prices, and also offer free shipping. I recommend purchasing the 2-pound bags to begin with to see if you like them. They offer a better value than the 1-pound bags. Freeze or refrigerate what you are not using right away. You may also be able to find these at your local grocers. You can usually find quinoa at your local health food store and often at Asian grocers, if you happen to have a good one in your area. Many grocery chains are now carrying this delicious, nutritious grain. If you can’t find it in your area, many products are available on-line, often with free shipping. You can get much better prices if you buy in bulk quantities. Quinoa comes in black, red, white and mixed. The more colorful, the more antioxidants and, therefore, the more healthy! I like this brand because it is made entirely with organically grown sesame seeds (no fillers or added oil) and because it comes in a glass jar. With all the health risks associated with plastics, I avoid them if at all possible. Watch this video to learn how to make Coconut Curry with Indian Spices! This recipe is from my new book, “Time For Change: Whole Foods For Whole Health!” It is a perfect food for transitioning to a plant-based diet. It is deliciously decadent and filled with health-promoting antioxidants and phytonutrients. YUM! There seems to be a learning curve to this business of making cooking videos. I made lots of mistakes in the production of this one, but the ladies from ElderSpirit were very forgiving and a lot of fun. Rather than cut out the mistakes or redo the video, I’m sharing it with you blunders and all hoping you will be equally forgiving. We did cut out a lot in the interest of time and clarity. I started to explain about how healthy garlic is and I managed to botch that section of the video. Here is the lowdown as explained by Dr. Michael Gregor of NutritionFacts.org. Garlic is the number one cancer fighting food. However, the protective effect of garlic may be destroyed in the cooking process so it is better to eat it raw or to crush it ten minutes before cooking. Crushing the garlic allows the compound alliin and the enzyme alliinase, which are located in different parts of the garlic’s cells, to combine and form the powerful enzyme allicin. This enzyme, once created, is resistant to heat. It takes ten minutes for that enzymatic process to take place. Hmmm… How do I fix this? Another gaffe I made is I forgot to put the spices in towards the end of sautéing the onions. This allows the flavor of the spices to develop and adding them at the end of the sautéing process prevents scorching. Usually, spices are tempered in a little oil when cooking Indian and Thai dishes. Since we want to avoid using oil, which damages our endothelial cells and restricts blood flow, we add the spices at this point. Adding the spices later didn’t noticeably affect the flavor at all, however, try to remember to add them earlier. Just the fragrance of the dish while cooking will make everyone scramble to find a seat at your table. Also, because I was cooking for a crowd who did not care for spicy foods, I eliminated the chili pepper from this recipe. I really love it with the ground chili pepper but it’s fine to eliminate it if you wish. For simplicity I used a five-ounce package of organic spinach for this recipe, however you can add as much as eight ounces if you want to add more of this delicious phytonutrient. The original recipe calls for six ounces. This dish smells as good as it tastes. The aromas will drive your family and dinner guests wild while they are awaiting this treat. Again, don’t be intimidated by the number of ingredients needed. You’ll use these spices over and over. Measuring them out in advance into small bowls will prevent mistakes. It is easy to forget a spice if it isn’t handy. If you prepare the rice in advance, it will save you some time when you are scrambling to get food on the table. 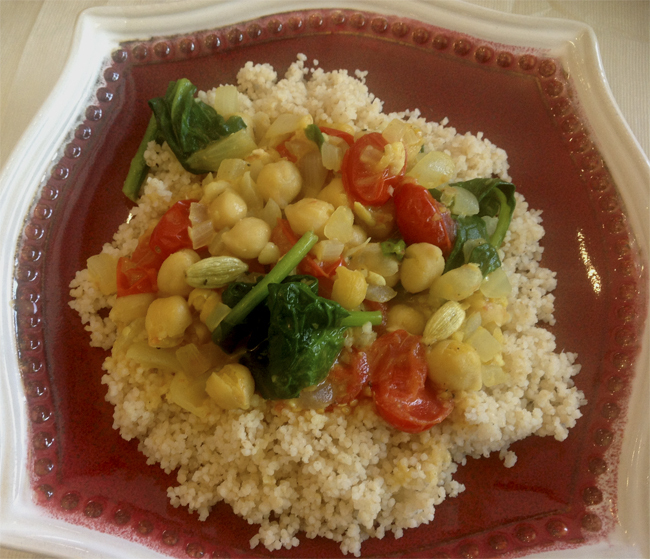 It is also very good served with French whole wheat couscous, which only takes 10 minutes to prepare. It is also excellent served over linguini. Note that the cinnamon stick, bay leaf, and cardamom pods are for flavor and should not be eaten. Pick the cinnamon and bay leaf out before serving; the cardamom pods will be harder to find so just warn your guests that they are not to be eaten. They won’t hurt them, but the seeds are very fibrous and have a woody texture. Plus, biting into them may give your guests a jolt of cardamom flavor that could be overpowering. Transfer drained, cooked chickpeas to a bowl. Set aside. Set aside cinnamon stick and cardamon pods. Measure remaining spices into a small bowl. Set aside. In a dry skillet, sauté onion with bay leaves, cardamom pods, and cinnamon until soft and translucent, stirring frequently (about 10 minutes). Stir in ginger and garlic. Sauté 2 minutes, adding a little water a tablespoon or two at a time if necessary to prevent scorching. Add turmeric, garam masala, ground chili powder, and black pepper. Stir until spices are fully incorporated with the onion mixture. Stir in coconut milk, tomatoes, and chickpeas. Cook for 5 minutes or so on medium heat until sauce is bubbling and tomatoes have wilted. Adjust spices to taste. Just prior to serving, remove saucepan from heat and fold spinach** into mixture until wilted. Stir in lemon juice and serve immediately over rice, couscous, pasta or grain of choice. *You can cook chickpeas on your stovetop if you don’t have a pressure cooker, though it will take longer. Or you can substitute canned chickpeas, drained and rinsed. **Don’t over-cook the spinach. It should be added no more than 5 minutes before serving. Spinach becomes a little slimy if allowed to cook for too long. Heat it only until it is wilted. In cooking demonstrations I often substitute couscous for rice, simply because of time limitations. Actually, couscous is very delicious with this dish. Coconut Curry With Indian Spices can also be served over linguini or angel hair pasta. 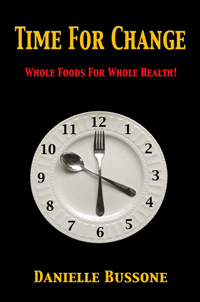 Please refer to my book, Time For Change: Whole Foods For Whole Health!, for instructions on cooking beans, vegetable stock much more. French couscous is a tiny crumble-shaped pasta that looks a lot like cracked wheat and its precooked form, bulgar wheat. If you store your grains and pastas in jars, be sure to label them. More than once I’ve had to call the large health-food chain in the next city to ask them to look up the bin number on the items I just purchased because I couldn’t tell the difference between cracked wheat and French couscous. When I buy them in bulk, I’ve learned to write not only the bin number but the name of the item on the package. French couscous is one of the quickest and least labor-intensive foods you will find. It only needs rehydrating in hot water. Boil the water, stir in the couscous, let it absorb the water and fluff. That’s all there is to it! It is a wonderful quick substitution for rice when you’re in a hurry or have forgotten to put rice on to cook in time for dinner. In a small saucepan bring 1 1/2 cups vegetable stock or water to a boil. Stir in couscous, making sure it all becomes wet. Remove from heat and let it sit for 5 minutes or until all of the water is absorbed. Fluff with a fork and serve. It is important to fluff couscous because otherwise it will become compact as it absorbs the liquid. Danielle’s region is SW Virginia, Tennessee and North Carolina, and anywhere she happens to stop for sustenance along the road. Contact Danielle directly to share your restaurant finds, to make comments or just to say hello. We are excited to post this video of how to make Paper Masala Dosa from Dosa Garden in Staten Island. We hope to have the full recipe posted soon.